What is the current thinking on how the brain processes generalizations? For example, the abstract idea of a right angled triangle vs specific instances of right angled triangles? Or the general idea of a cat vs specific instance of cats? How does a generalization live in the brain? What's the current thinking on how it is encoded? Medieval philosophers point to such abstractions (that are not material timeless "things") to argue that something itself not material and timeless must exist to "sense" them i.e. a soul. Which is hogwash. But how does one state the nature of such things in terms of human cognition? What is going on when we consider such abstractions? The thing that comes to mind first are the Gestalt principles. Up front - the Gestalt theory of perception has been criticized as being a descriptive theory, and not providing much insight into the processes that lead to perception. The similarity principle claims that elements tend to be integrated into groups if they are similar to each other. Accroding to the excellent book The Big Book of Concepts by Gregory Murphy, in the prototype view every category is represented by a summary of representation features, with weights for each value of each dimension (e.g. color, hair length). When a new member of the category is encountered we add weights of the present features and subtract the weights of it's features that are not parts of a category, and if above a certain threshold then it is judged to be in category. The prototype is the generalisation that you are looking for. [...] is a cognitive process of transferring information or meaning from a particular subject (the analogue or source) to another (the target). An analogy is often considered between to somewhat seemingly unrelated subjects (e.g. an atom vs the solar system), sharing an abstraction, i.e. a general abstract concept. 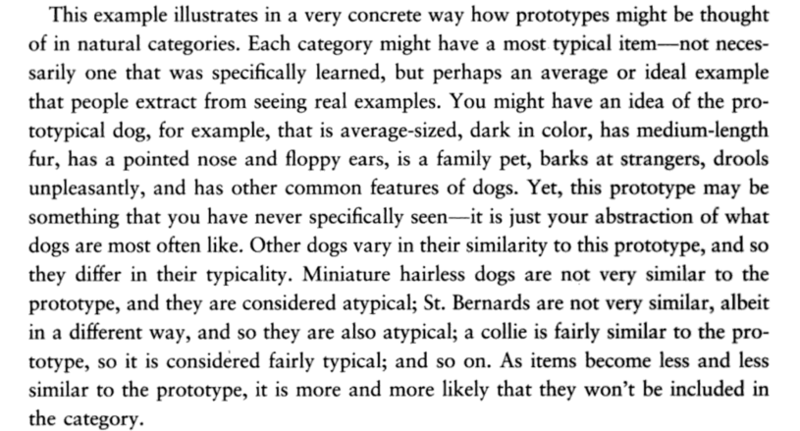 This abstraction may be similar to your "general idea of a cat", which can be specified to specific kind of breeds. French, R. M. (2002). The computational modeling of analogy-making. Trends in cognitive Sciences, 6(5), 200-205. Not the answer you're looking for? Browse other questions tagged cognition or ask your own question.